In May 2003 I underwent a bone marrow transplant to cure a fatal cancer. I had a difficult recovery, so in Fall 2004 my husband, John, learned a "compassionate intent" meditation from the Institute for Noetic Sciences. During this daily meditation he directed compassionate intent to me to promote my healing. 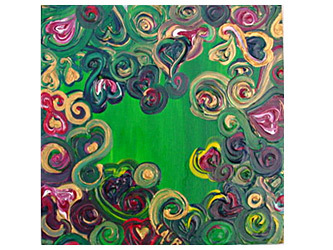 After three months I painted my first Love Garden - an expression of what it felt like to receive this healing energy. I went on to create over 100 pieces of Love Garden art!